The Killers was founded in the spring of 1982, and since then, their philosophy has always been total pest elimination, not pest control. Our goal has always been to provide the best service available and to do what’s right for the customer while taking the environment into consideration. Rick Bock purchased his first two offices in 1991 which are located in Salem and Newport. He has worked hard to successfully reach his goal of offering customers the best service around. Rick hired Matthew White in the fall of 1994 where by Matt started inspecting homes and setting up services for customers. After a lot of hard work, Rick was able to purchase the Portland Metro offices in 1995. In the spring of 1996, Matt was promoted to Manager of the Portland offices and Head of Operations in 2001. Rick and Matt have helped develop some of the best people in our industry with their hands-on approach and continued training. Rick and Matt’s principles are, and have always been, to provide superior service and to use the best products available. The Killers has continued to grow every year and we credit this to the efforts of our great staff and their willingness to strive to be the best in our industry. Rick and Matt are now co-owners of The Killers. With our staff and over 4000 customers believing in us, Rick will be retiring after 20+ years in the industry. With Rick’s anticipated retirement, it was necessary to fill the manager position at our Newport office. Rather than simply control pests on your property in Portland, we make sure the pests are completely eliminated. At The Killers, we handle a wide variety of different pests, taking care to remove them from your home or office in Portland and ensure that they do not return. When you call us for your pest control, you are getting over 30 years of dedicated service in the Portland area. Having operated in the Northwest for that length of time, our technicians have the expertise to deal with any type of infestation. We fully inspect your premises and discover the location of any infected areas. From there, we determine the best course of action for your unique problem. 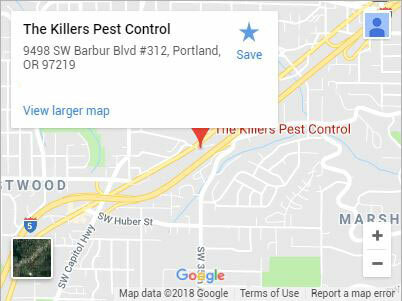 Being able to identify the specific insects and rodents that live in the greater Portland area and knowing their hiding places and habits allows The Killers’ exterminators to design a specific pest control plan that will thoroughly eliminate the infestation. These pest control plans ensure you get the right one for your concerns as well as your budget. We are proud of our company and proud of the work that we do. We look after our customers while also being sensitive to the natural environment. When you need pest elimination you can count on, call The Killers.